FINAL TEXT: Deal Physical damage to target enemy. If target was Target Locked, all Droid allies recover 5% of their leader's Max Health and Protection. FINAL TEXT: Deal Physical damage to all enemies and inflict Target Lock for 2 turns on the selected target. 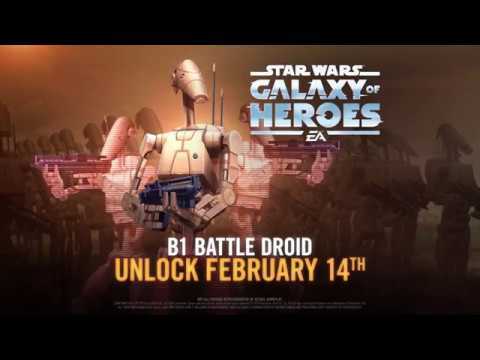 Gain 1 stack of Droid Battalion for each other Separatist ally. Heal target other Separatist ally for 0.5% Health and 0.5% Protection for each stack of Droid Battalion. FINAL TEXT: When another Separatist ally uses an ability during their turn, B1 assists dealing 40% less damage (limit once per turn). When another Droid ally uses a Special ability, B1 gains 15% Turn Meter. FINAL TEXT (ZETA): B1 can't score critical hits or be revived. 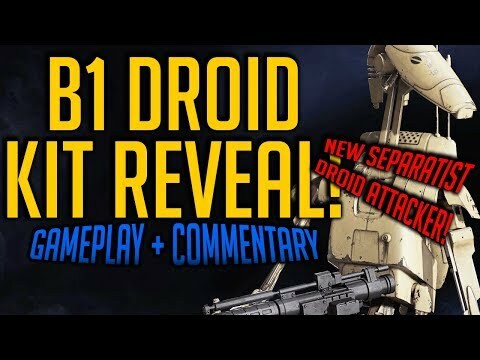 B1 has no Protection, 1 Health and 100 stacks of Droid Battalion, and can't be defeated or destroyed while they have Droid Battalion. When all stacks of Droid Battalion expire, B1 immediately destroys itself. B1 is immune to Damage Over Time. When B1 takes damage, they dispel all debuffs on themselves and lose 8 stacks of Droid Battalion. At the start of B1's turn, they gain 3 stacks of Droid Battalion. This sounds very op already. I like the sound of this. That basic is nice. Curious about the gear B1 is going to require. Possibly no Mk5 Stun Guns or Mk5 Droid Callers? It's a bit weird to give it gear that includes added health when it can't possibly add to health. Wow! I thought b1 was going to have a zombie kit, but this is much more interesting. I like it! Is there a cap on the stacks of Droid Battalion? Annihilate ‘instantly defeats’ an enemy. Can't be annihilated (MobileGamer mentions this in the video). Wouldn't be too sure about that. Unlike vs raid bosses (99999 dmg) Nihilus' annihilate doesn't do damage vs regular characters and therefor the B1 shouldn't even lose any stacks ("When B1 takes damage, they dispel all debuffs on themselves and lose 8 stacks of Droid Battalion"). This might also screw up DN's AI as it prioritizes the least healthy opponent if I'm not mistaken (at least you often see a DN on auto annihilating a red health opponent when there's a tank like Baze/Shore/whoever that has nearly full health+prot). This sounds OP! Can’t wait to use him! Possibly yeah, wouldn’t surprise me if they added a clause so it still loses stacks though. I’d also imagine they’ll tweak DN AI to account for B1 being constantly on 1 hp as well. Question: what's the point of ever leveling/gearing B1 up beyond the point where he has access to all his abilities? He dies in one hit, right? No expenditures necessary (or in fact, advantageous). Just checking... zero Cooldown on special ability “Blast em.” Is that right? General Veers likes this character. Mother Talzin likes this character. Didn’t notice it was not death-revive like NS Zombie. Guess Veers and Talzin can’t take advantage of it. "can't be defeated or destroyed while they have Droid Battalion"
This makes me think Grievous will have stacking or at least very high max health and protection. The B1 can't be defeated or destroyed while it has stacks of Droid Battalion so I don't see why Veers or Talzin would like it. While it seems pretty clear that multi-attackers like Raid Han or Princess Leia would remove 8 stacks with each attack, I am Interested to see the interaction with characters like Scavenger Rey’s Flurry of Blows and Sabine Wren’s basic. Does dealing damage multiple times remove 8 stacks of Droid Battalion each time (32 in those cases), or just once? Minor point but nilly does do damage outside of raids, if you try him against dooku on (I think) the bonus level of the nightsisters event you'll see him repeatedly fail to instantly defeat him with annihilate. I have never been in a position to check outside of that event or a raid though. Should behave the same way as the raid bosses who get 5% TM each time they take damage. "As long as this unit isn't Toppled, it has +1 Bonus Action (with a 50% chance to gain an additional Bonus Action each turn) and gains 5% Turn Meter whenever it takes damage." So with Hans double tap it should take away 16 stacks of Battalion. The Dooku in this event is considered as a "raid boss" (Isolating him with Traya gives your characters the health steal up and crit damage up buffs which you get when damaging an isolated raid boss). Good question, has to be 8 stacks per instance of damage. Group attacks and counter-attacks may be able to drop this guy quickly. The healing from B1 alrdy looks sick. Whenever a seperatist uses an ability (you don't even need to attack) the B1 assists and heals all droid allies for 5% of your leaders HP + protection when the target is target locked (and Grievous alrdy has the 3rd highest max HP of all characters). On top of that you can still use the special and heal a separatist ally for 0.5% health and 0.5% protection for each stack of Droid Battalion (so 50% each when he's on his "default" stack).